I’m listening to my favourite radio show this morning while I write this post. 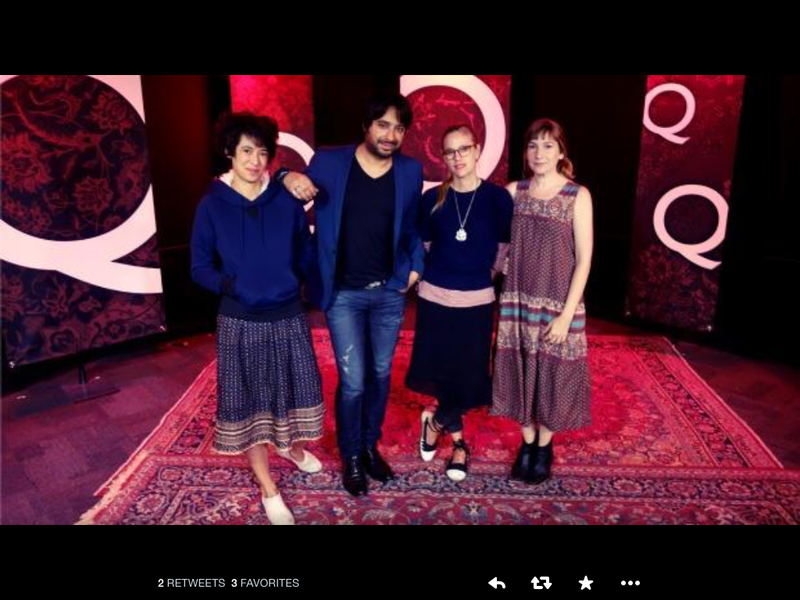 “Q,” hosted by Jian Ghomeshi, can be heard on CBC radio every morning. Today Jian interviewed Canadian icon Neil Young, much loved by all Canadians, but especially by those of us who remember the 70’s. 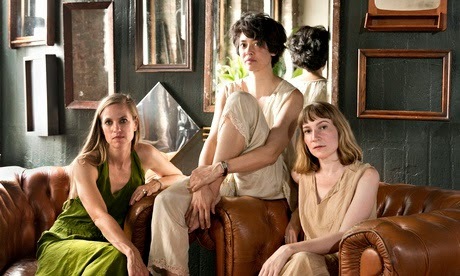 A few weeks ago I listened when Jian spoke with Sheila Heti, Heidi Julavits and Leanne Shapton, the editors of a new book on fashion called Women in Clothes. 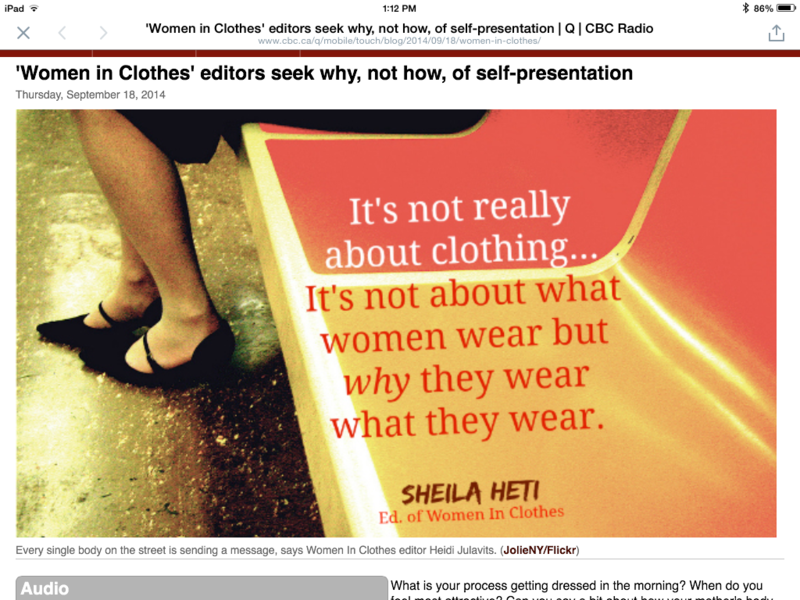 Tien, who clearly loves the book, goes on to say that Women in Clothes is something new…”a conversation about style that kicks the ostensible rule box in the pants, using history, memoir, art, design, philosophy, psychology and sociology as tools for discussion. A true conversation, after all, has more than one side.” You should read Shannon Tien’s review for yourself here. Before the interview with the creators/editors of the book, Jian (and the staff of “Q”) initiated a conversation about fashion with his audience. Then I watched as the other tweets rolled in. And to my chagrin… I appeared to be the only one who actually thought they wanted me to describe my style. Everyone else’s response seemed to be in jest, ironic or… at best… terribly self deprecating. Comments like “Grandma dressed by colour-blind toddler” (Erin Bassler) or “Chronically overdressed because pants don’t fit” (Laura Simmons) or “Most days, I’d rather sleep in” (Fabiola Carletti) made me realize that I was the only one who didn’t think this was supposed to be a joke. And I felt like an idiot! And then I began to get pissed off with myself. So what if I was the only one who responded seriously. So what if I put that picture and those six words out here. Live by the Tweet; die by the Tweet. That’s what I look like… some wrinkles around the eyes, more on my neck, not a fashion model (who is…except for fashion models) but still trying to look my best. And those six words actually describe what I wear … most of the time. “Skinny jeans, good jacket, vintage jewellry.” Yep, that’s me. Outfit #1: J-brand skinny cords, Smythe jacket, vintage brooch. 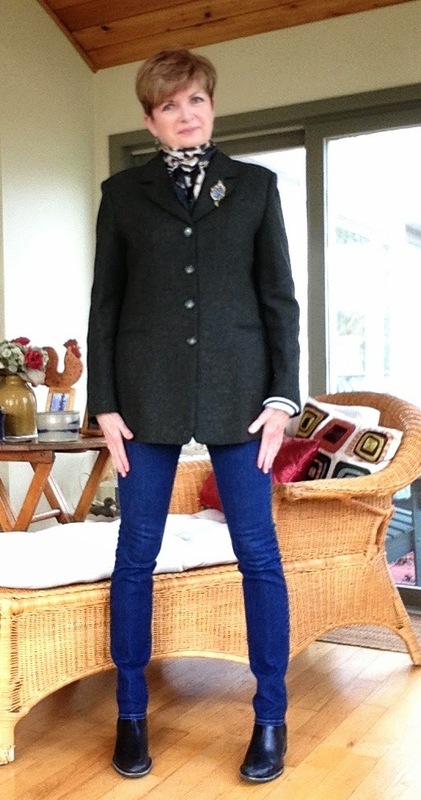 Outfit #2: J-brand skinny jeans, Max Mara jacket, same vintage brooch. I just have to say that I love everything about this Max Mara jacket. I love the length, the dark green tweed, and the 4-button style. I bought it way, way back in the 90’s. Then I put it away, maybe, 10 years ago but thankfully did not get rid of it. I pulled it out last fall when I saw that long jackets were becoming popular again. Yeah me. 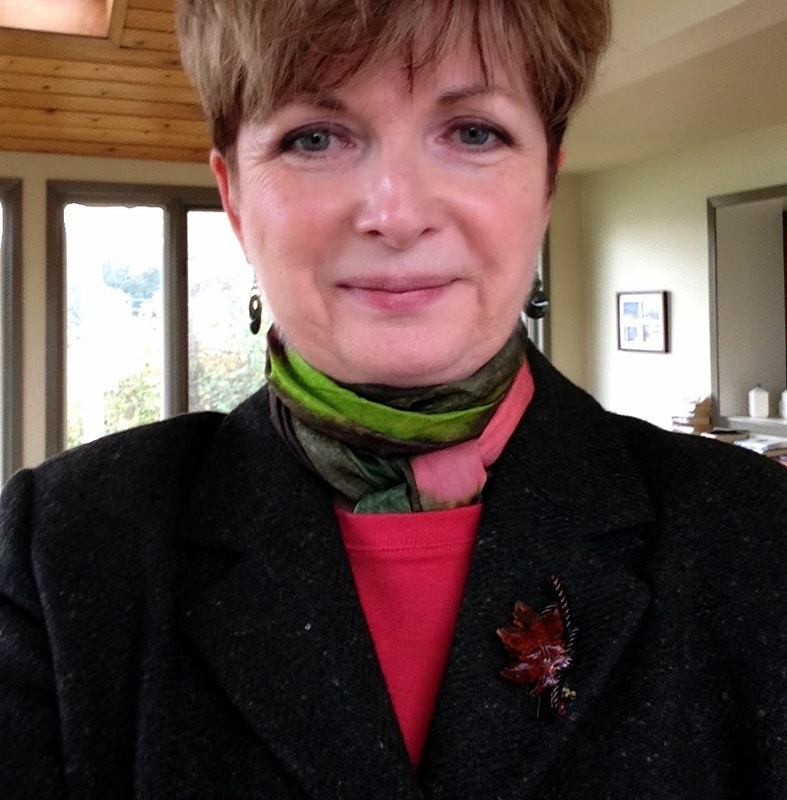 I also like it with my red Gap tee shirt, a green/pink scarf I’ve had since university, and my vintage Bakelite maple leaf brooch. Outfit #3: Skinny brown “Not Your Daughter’s Jeans”, Max Mara jacket, vintage brooch. Same red Gap tee shirt as above. 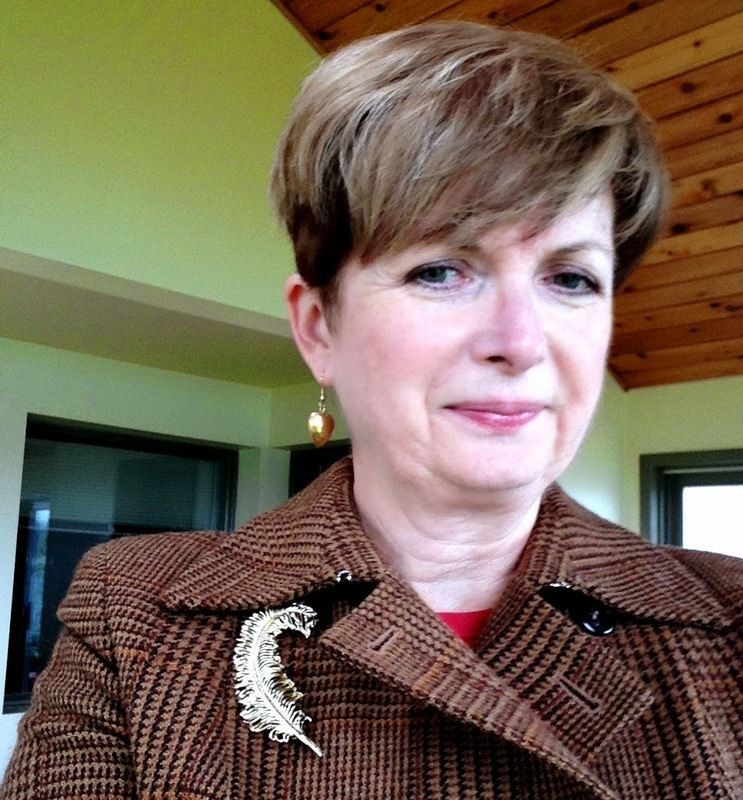 So that’s my style in six words… and three jackets, three pairs of skinny jeans, and three vintage brooches. Thanks Jian (and the staff of “Q”) for helping me define my style in six words. Even if I did have a few hours of face-flushing, stomach-churning embarrassment. 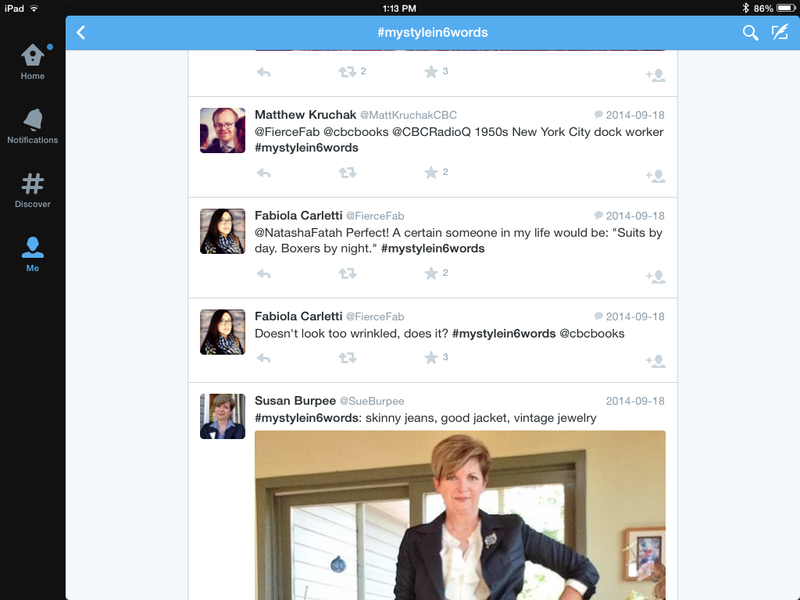 And speaking of that book Women in Clothes. After reading Shannon Tien’s review I was planning to run right out after I finish this post and buy it. Phew….harsh words. And I thought we were tough on Eleanor Catton last week at book club. You should really read the entirety of Carroll’s review here. And when you do, be sure to read the irate response from editors Heti/Shapton/Julavits in the comment section. Still… I may run out to the book store after this… grab a coffee and sit down with the book for a half hour. To make up my own mind before I decide to buy… or not. I’ll report back later on my findings. And we can have another conversation about style. Meanwhile….can you describe your style in six words? Please. For me it's "Bright colour, good lines, second hand"! Sounds good…thanks for sharing! And for stopping by. You have me wanting to read the book…I was not familiar with it! I love that green scarf with your jacket and pink top! Thanks for sharing with the Thursday Blog Hop! Thanks for hosting the link-up, Pam. i don't know why anyone would bother to respond to that question ironically. either you think it is a fun and thought provoking idea or you skip it. you did just right and have no reason to be embarrassed. my six words are "classic, tailored, simple, relaxed, colorful, fun." susan, you always get me thinking. thanks. Thanks, Susan. And thanks for reading, as always. My previous comment disappeared:( but the gist was I think your response was appropriate and you look fabulous in the picture you posted. 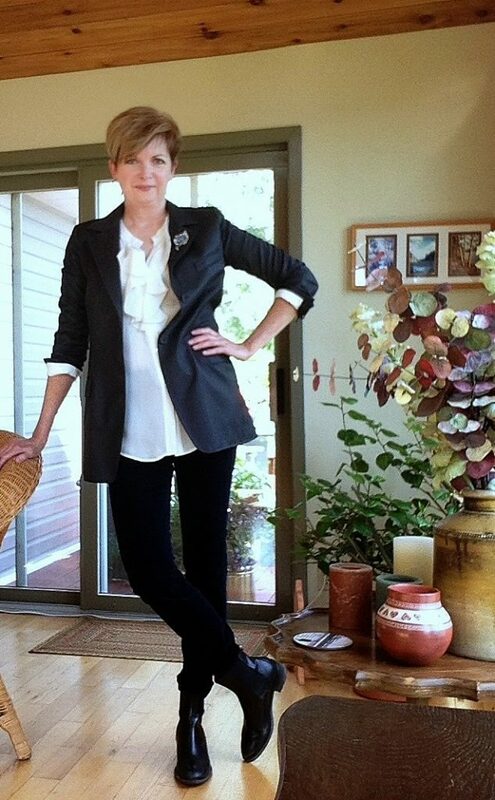 My style lately is BF jeans, tee or shirt, cardigan, pearls, flats or ankle boots. Sorry about that Brenda. Blogger seems to eat comments when you sign into Google. When I'm commenting on someone else's blog now, I always write my comment and then copy it before clicking "Publish" and signing into Google. When the 'Comment" page reappears and my comment is gone…I then paste in back into the box. Such a pain….not sure why Blogger does that! down-to-earth, practical clothing that is easy-care and comfortable but also feminine and fresh — that's 6 words if you just count the adjectives! Yes….a 6-adjective style description. Knowledge of grammar required…warms my English teacher heart. Thanks, Joan. Love your style and that you have honed into 6 words! For me…feminine, fun, laid back is what comes to mind. P.S. Hope you will stop by and join TBT Fashion link up on Thursday. Thanks Alice. I will definitely check out the link-up on Thursday. Halfway through reading the book. (It's a lump.) Half and half on whether I like it. It is full of the kind of ideas I find fascinating. They are right – there was a gap in the market – and some observations are very smart. But. But it seems to me they've done a vast amount of research and …. OK it is divided into subjects … but apart from a little tidying up, what they have given us is a just huge book of source material. From which someone else could write an essay or put together some theories. It is taking me too long to read everything, for the sake of finding the good bits. No, I don't think I'm lazy. But perhaps they are? Personal style would be: "looking girly in boys' clothes" if I'm honest. Interesting comment. That's what one review said about the book. I doubt I will buy it, but plan to have a sit down with it (and a coffee) at Chapters. Thanks for stopping by. My style? This is something I’ve been trying to nail for sometime, with lots of ideas but nothing quite clicks. Simple, chic, subtle? However I do know what I like when I see it. It’s hard to put it into words isn’t it? I thought it was kind of a fun exercise.